Reader Mike sends us word that he was the lucky winner of the Grand Theft Auto IV Elite Sweepstakes Console nine months or so ago. And his prize just arrived. 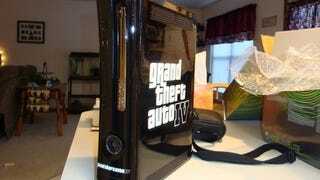 The ebony black Xbox 360 Elite sports a slick GTA IV logo, which at first glance may look like a sticker but is actually embossed on the case underneath a clear shell.